Meade's major tourist attraction, the Dalton Gang Hideout, was formerly the home of Eva Dalton Whipple, sister to the infamous Dalton Gang. Eva Dalton came to Meade in the mid 1880's, and was married to J.N. Whipple, a Meade merchant, in 1887. Whipple built the house which still stands at the corner of Pearlette and Green Streets in Meade for his bride. Years after the couple left Meade a deep rain wash covered with timbers and earth was discovered; a tunnel from the house to the barn built into the hillside below. 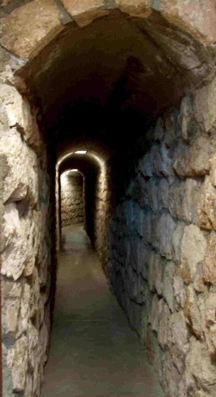 Legend has it the tunnel was used by the gang to come and go undetected by the law. 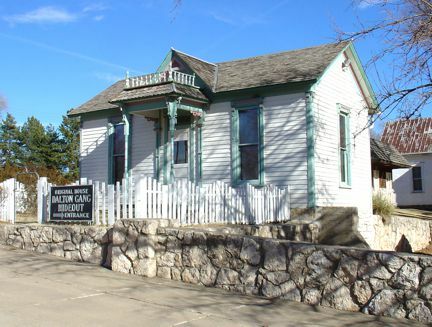 in 1940 the Meade Chamber of Commerce purchased the old Whipple property and the Dalton Gang Hideout became one of the first tourist attractions in Southwest Kansas. Much of the landscaping and improvements were accomplished by the use of WPA labor. These crews built the rock retaining walls and NYA crews reconstructed the tunnel and barn. Rock for the projects was quarried from the Clark Ranch east of Meade. The park was completed two years later in March, 1942. Since that time, hundreds of thousands of visitors have taken the eerie trip down the 95-foot-long tunnel to explore Eva Dalton's house which is furnished as it would have been in her day. 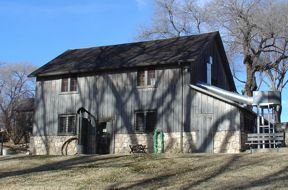 The barn serves as an entrance to the attraction and houses a gift shop on the ground floor and museum artifacts in the loft. Handicap accessible restrooms as well as a shady park are available on the grounds. At the south end of the Hideout park you will find "Old Town" a wild west town facade built for historical reenactments and gunfight competitions. Kids love to pose for photos behind the bars of the jail or in the old casket propped up on the undertaker's wall. Just up the hill from the Hideout barn is the Heritage House, a wonderful old home furnished as it was in the 1890's. There's lots to see a do at the Dalton Gang Hideout... plan to stay awhile! The Dalton Gang Hideout is open year round. It is located 4 blocks south of Hwy 54 at 502 S. Pearlette St.
Open Monday - Saturday 9-5, and Sunday 1-5. We have an excellent book about the Dalton Gang Hideout and Eva Dalton Whipple's life in Meade, Kansas, called The Dalton Gang and Their Family Ties. The book contains excellent Dalton family genealogy as well as interesting stories relating to the infamous gang that can be found nowhere else. The book can be purchased at the Hideout or on-line at www.prairiebooks.com.